Vistula River with its 1000 km length is the longest and most important in Poland. In the Baltic Sea basin, it is the longest and second most navigable after the River Neva. The exact length of the Vistula is measured at 1047 km and its basin covers an area of about 198 thousand sq. km. The long course of the river passes through the cities Krakow, Warsaw, Plock, Torun and its delta in Gdansk. Along it are some of the biggest attractions of Poland, the Royal Babel Palace, dominated by the eponymous hill, towering above the Vistula. Vistula River originates from springs located at an altitude of 1106 meters above sea level on the western slope of the mountain Barania Góra, in southern Poland, which is located in the Western Carpathians. Vistula departs from the main springs Biała Wisełka, and especially Czarna Wisełka, which is considered its main source. It then continues to flow through the big field plane, passing through several large Polish cities, including Krakow, Sandomierz, Warsaw, Plock, Torun and finally end and Gdansk. End of the Vistula is in the Gulf of Gdańsk on the Baltic Sea, 15 km east of Gdansk, is where it flows. The delta of Vistula formed several branches - Leniwka, Przekop, Śmiała Wisła, Martwa Wisła, Nogat and Szkarpawa. Vistula was formed about two million years ago during the quaternary period. For the first time historical chronicles make mention of the River Vistula from Pliny and its natural history, somewhere around 77th year. The ancient historian mentions the river under the name Vistillus. It is assumed that the name has Indo-European roots. The ancient Greek pillar Ptolemy mentioned the name of the river as Ouistoula. Further, the name through the Anglo-Saxon work of Widsith, which speaks of the river under the name of the Wistla. 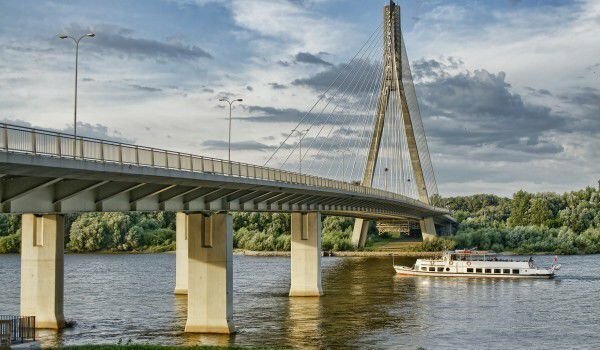 River Vistula is divided mainly into three parts: upper - from its source to the town Sandomiesh, middle - from the mouth of Sandomiesh Narew and Bug, and the lower part, along which is the distinct landmark mouth of the Bug and the actual inflow of the Vistula into the Baltic Sea. Over the years, the River Vistula often reached catastrophic proportions, and often caused floods, displacement of people, etc. According to the gloomy forecasts, by 2100 as a result of climate change, the whole area around the Yangtze river will be submerged below sea level.